Scallops, when cooked properly, are deliciously sweet and tender, needing very little fat or added flavor. Just a few on a plate turns dinnertime into quite a delicacy. It can be truly disappointing when the scallops you are eating do not live up to these standards. It might be that the scallops you think you are eating are not scallops at all. Learn a little bit more about scallops to find out what it is you are eating. Scallops are a bivalve mollusk of the Pectinidae family and are related to clams, mussels, and oysters. There are many varieties of scallop, but the most common is the tiny bay scallop, found in East Coast bays and estuaries, and the larger sea scallop, which exists in the deep cold waters on the ocean floor. Bay scallops are most often less expensive than sea scallops, especially when the sea scallops are very large. The bay scallop is actually the adductor muscle (which hinges the two shells). The remaining part of the bay scallop is the coral (ovary or roe) and is inedible. A typical bay scallop is about half an inch wide, is a pale pink or light beige color, and has a soft texture. Sea scallops are more than three times larger than bay scallops and can be up to 2 inches in diameter. They are a little chewier than bay scallops but still tender. Both bay and sea scallops are somewhat irregular in shape. You may notice diver sea scallops as a seafood specialty on restaurant menus. A diver scallop is a sea scallop that is harvested by hand by a scuba diver instead of being dredged. This may justify the higher price tag, especially since diving is better for the environment—there is no machine disturbing the undersea flora and fauna. Whether you choose bay or the sea variety, scallops are usually sold by the pound and often in packages. The packaging is marked with the letter U and a number (or range of numbers) indicating how many scallops are per pound. The "U" stands for "under." So a package of large sea scallops might say, “U-10,” meaning there are 10 or fewer scallops per the pound, giving you a point of reference for how large the scallops actually are. In contrast, a package of bay scallops might be labeled “U-30/40," which means you would get 30 to 40 bay scallops in a pound, meanwhile, you will get just 10 sea scallops for the same weight. Pre-packed scallops may also be distinguished by the terms “wet-packed” or “dry-packed. Dry-packed is what it sounds like: you are getting just the scallops and nothing more with no water or preservatives (and they will feel sticky). The flavor is more pure and concentrated and likely the freshest. The downside is this type has the shorter shelf-life. Wet-packed indicates that the scallops are sitting in a brine solution meant to extend their shelf-life, and will be somewhat slick. The downside is that the scallops absorb water and plump up, giving them a less pure flavor and a tougher texture. 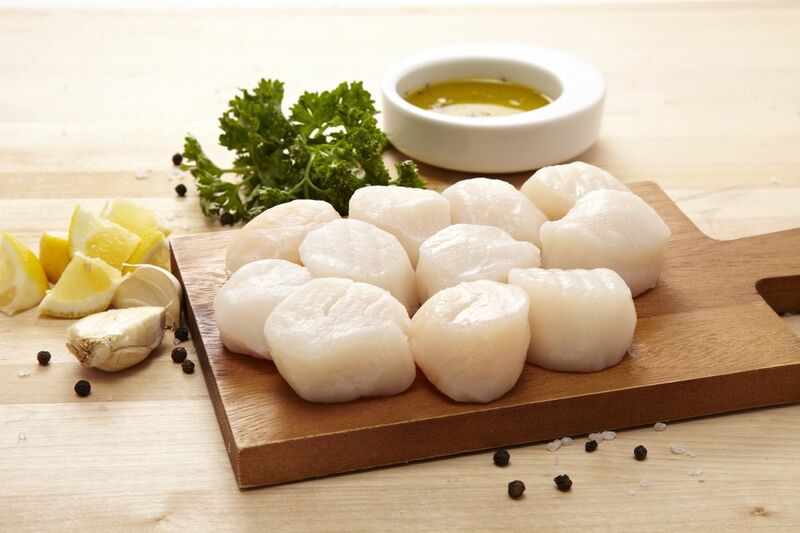 In most cases, dry-packed are preferred, but if wet-packed is all that is available, give the scallops a good rinse before using to get rid of the brine and preservatives used in the packaging. Because scallops are a prized type of shellfish that can reach $30 a pound, there are, unfortunately, some shops that will try to sell fake scallops. Certain unscrupulous fish markets and grocery stores have been known to swap out pieces of less expensive large sea scallops for smaller, more delectable bay scallops. Worse yet, some fish counters substitute shark meat for scallops—charging you for pricey scallops while they paid significantly less for cheaper shark meat. If you are questioning whether you have the real deal on your plate or not, there are a few tips to help you decipher if the scallops are authentic or fake. Since scallops are an animal, each individual scallop is not shaped exactly the same—they are slightly different in size, and will not be perfect cylinders. Fake scallops, however, will look identical to each other as they were made using something like a round cookie cutter. The texture of the scallop should also be a good indicator as there are distinct grains or fibers running lengthwise in real scallops, as the edible part of scallop meat serves as a muscle that holds the two scallop shells together. A fake scallop would appear to be more solid and dense. If you are specifically looking for imitation scallop (usually crafted from a fish paste blend), there are some honestly-labeled imitation scallop products, similar to imitation crab and lobster sold by reputable seafood firms and grocery stores. This imitation fish was popularized by the Japanese in the 1960s. Imitation fish, or surimi, became a marketable way to make use of "fodder fish" or bycatch.